Alolan Raticate (Sun & Moon, 77/149) comes out of the most recent Sun & Moon expansion and is a 120 HP Stage 1 Pokemon. Alolan Raticate has an unusual attack - Evil Orders. For two colorless energy, you may search your deck for a number of cards equal to the number of Pokemon on your bench. Important to note here is that you may search for any card you want. Special energy, Pokemon, Item, Supporter, anything you want, no exclusions, no exceptions. If you have five Pokemon on your bench, you can go grab any five cards you want out of your deck. Double colorless? No problem. Evolution Pokemon? Yep. Lysandre? Sure. Stadium? It’s yours. Any card you want, any amount of cards up to the number of Pokemon on your bench. Also important to note: you do not have to take that number of cards, you can choose to take less. I remember seeing this card and thinking, “Wow! This is going to change the game.” I have still not come across Alolan Raticate yet, however, in now almost two months of play since SUM’s release. I haven’t tried to put it in a deck yet either, so this review provided an excellent opportunity to do that. I have tried it in a couple of different versions of Tauros GX (Sun & Moon, 144/149). In one I tried to pair it with Herdier (Sun & Moon, 104/149), but I only went 4-6 with that version. I’ve tried Tauros GX also just with a 4-4 line of Alolan Raticate, making Evil Orders the focus – going for that first and foremost, and then attacking with Tauros GX and hammering the heck out of my opponents. I’m struggling with that as well, however, going only 2-4 with it. I have also tried it with Darkrai EX (Breakpoint, 118/122), but I only went 2-3 with that version. This has frustrated me a little – this seems very similar to Dragonair’s (Sun & Moon, 95/149) Dragon’s Wish. In my mind, I should be having a lot more success with this. Getting any five cards you want out of your deck should give you a HUGE advantage! Somehow, for some reason, it’s just not working the way I want it to. I’m not sure exactly why, not sure what adjustments I need to make, but this is DEFINITELY worth pursuing. There’s a deck out there for Alolan Raticate. There’s a deck out there that will be very good and Evil Orders will drive that deck’s success. 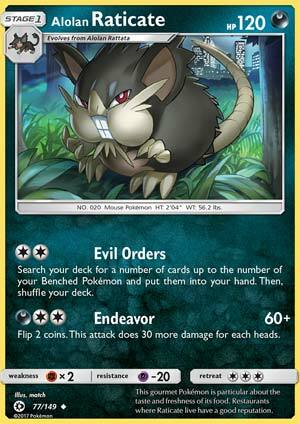 Maybe the card or cards that will have the perfect synergy with Alolan Raticate don’t exist yet, but I’m betting that at some point Alolan Raticate will be an integral part of a very good deck. I just can’t give it more than a 3 out of 5 because I can’t figure out what that deck is. Just a quick post-script to the above: Alolan Rattata (Sun & Moon, 76/149) is the basic evolution of Alolan Raticate, and it’s not bad for a stepping stone basic. Although its 40 HP are frighteningly low, it has a free attack (Gnaw) for 20 damage, and it has the always popular free retreat. Also, I should mention that about half of the times that I played Evil Orders, 5 times in 11 plays, my opponent played N (Fates Collide, 105/124) and sadly whisked away all of the cards that Evil Orders had brought me. Oh I wish for a moment that there were a card that would prevent the effect of N on my hand… but then I remember that I did a study on N that showed for every time my opponent played N and it reduced my hand count there were twice as many times where he increased the number of cards in my hand, thereby almost certainly improving my standing in the game. Alolan Raticate (Sun & Moon 77/149) is a Darkness Type Pokémon, which would be more impressive except long-time TCG players are already used to the idea thanks to Dark Raticate (EX: Team Rocket Returns 17/109). In fact, I am too used to the idea, since I had to check to make sure they never made Raticate part Dark-Type (in the video games) because it seriously feels like a natural fit. Getting back to the TCG, being a Darkness Type isn’t great for Weakness or Resistance: only some Psychic Types are Darkness Weak while all Fairy Types are Darkness Resistant. Darkness Type support is fantastic in terms of fellow Darkness Type Pokémon having valuable effects, whether Abilities, attacks, or both. There are some tricks based on just the [D] Energy Type, but most of the Darkness (Pokémon) Type-specific effects aren’t as impressive as they once were… save for Dark Patch, in Expanded. There are Darkness Type counters, but as usual, they were too niche to prove practical, even when Darkness Types have been and currently are strong. Yeah, even though really only good because of the capabilities of the actual Darkness Type Pokémon, which often (but not always) need to be in at least a partially Darkness Type deck, they are so good that it lifts up the entire Type: good for Alolan Raticate. Being a Stage 1 is adequate, as it isn’t too slow or cumbersome to ruin a card, but it isn’t a big help either since Basic Pokémon still set the competitive baseline. 120 HP is not enough to reliably soak a hit once a deck gets going, but it isn’t crippling, either, except perhaps when the Fighting Weakness comes into play (making it an effective 60 HP). Psychic Resistance might actually be important given the HP is so borderline; -20 could be the difference between hanging on or being KO’d. That chunky Retreat Cost of [CCC] means you’ll need more than the average amount of alternatives or assistance when it comes to retreating. Which brings us to this card’s attacks two attacks, “Evil Orders” and “Endeavor”. The former costs [CC] and allows you to search your deck for a number of cards equal (or less than) the number of Pokémon you have on your Bench. For [DCC], Endeavor does 60 damage, then has you flip two coins where each “heads” is good for another 30 damage. While being able to snag cards from your deck is an important, timing matters. So do the full requirements. If you don’t use Wally and go second, both players have already had at least one turn to set up. For many competitive decks, this means they have already begun to deal out damage or are about to do just that. To search for more cards, you need to fill your Bench. With Sky Field, you could get up to eight cards… but not only can your opponent force you to shuffle it all away with a simple N (that fairly frequently used Supporter), but to use an attack that aids in setting up you… have to set up. I get it; this will help an even more elaborate setup, but how often do such decks work? It will help with maintaining your field presence but how long before you or your opponent trash your own hand? Endeavor isn’t too bad for powering up, especially in Expanded: a Dark Patch plus a Double Colorless Energy from hand takes Alolan Raticate from zero to Endeavor in one turn, provided you can then promote it from the Bench. Two coin flips mean four possible outcomes, but two result in the same amount of damage so we are looking at 25% being 60, 50% being 90, and 25% being 120 damage. For three Energy, 90 is decent, so long as the rest of the card is worth it; 120 is solid, while 60 is bad. Put it all together, and if the rest of Alolan Raticate was better, this could work… but it isn’t, so I don’t think it does. Maybe Alolan Rattata (Sun & Moon 76/149) helps? It is a Basic Darkness Type Pokémon with 40 HP, Fighting Weakness, Psychic Resistance, a free Retreat Cost, and the attack “Gnaw” for  doing 20 damage. That… is actually not bad. A free Retreat Cost is as good as it gets while being able to attack for 20 without Energy required and Psychic Resistance has some merit. Too bad Evolving doesn’t just cost you the free Retreat but nearly inverts it, with a Retreat Cost of [CCC] being the second highest printed on currently legal cards, and the 40 HP making it so you need to Evolve ASAP. It begs the question; do the two really complement each other, save that there either could have been much worse and there isn’t something irritating like having two different Energy requirements? So yeah, not seeing a good use for Alolan Raticate in Expanded or Standard play. This kind of attack really wants to be used on your first turn, where the current first turn rules halve your chance of pulling it off even if you go to the effort of using a card like Wally to immediately Evolve Alolan Rattata into Alolan Raticate. You need to actually invest quite a bit for Evil Orders to serve up enough cards to be worth just giving up an attack with a Stage 1 that has two Energy attached. If we get some massive wall of a Pokémon, especially a Basic, that can effectively copy the attack, then maybe it would work. Probably not, though; consider how Pokémon Fan Club can snag two Pokémon from your deck at the cost of your Supporter for the turn but using it to get one Basic plus either Hoopa-EX (XY: Ancient Origins 36/98, 89/98; XY: Black Star Promos XY71) or Shaymin-EX (XY: Roaring Skies 77/108, 106/108). Both of those Pokémon are used in competitive play, the latter rather heavily, but when they are used as a combo, people just use Ultra Ball. If they want an attacker that searches out stuff, we’ve got Talonflame (XY: Steam Siege 96/114); odds may not be great you’ll actually open with it, but it does work splendidly in certain decks, and a major mark in its favor is you use it for setting up, and not just for further setup after filling your Bench and Evolving. It only gets two cards, but it gets two cards, and for just [C], while being a Stage 2 you can open with via its “Gale Wings” Ability. Alolan Raticate and Alolan Rattata can sink their teeth into Limited play, where almost everything good about them becomes better while almost everything lacking is at least less lacking, maybe even a little bit good. Alolan Raticate wishes it came out about 10 years ago… or possibly in the future. No, nothing about a specific future release. This card seems to have been designed while ignoring that using attacks for setting up is slow, even slower than it used to be because of the first turn rules and needing to Evolve to access the attack, forgetting that it requires you to largely be set up already, and that there is a high likelihood that your opponent can force you to shuffle away everything you just wasted all that effort to search out with a commonly played card (N). I will allow the possibility, especially due to decks which effectively lock down Items or Abilities, that just maybe some quite complex deck will emerge that needs a massive card investment so that having to dedicate space to filling your Bench and quickly Evolving into Alolan Raticate to perform further set up becomes a good deal. Not sure what it would look like, just theorizing about what it might be like if it were to happen. That or something with an effective way of copying Evil Orders, in a way that addresses most (if not all) of the above issues. We have cards that can copy the attack, like Mew-EX, but it doesn’t actually solve the other problems (and actually adds to them, since now you’ve got 120 HP target worth two Prizes up front).